On Saturday 30 June, Southampton Youth Orchestra will celebrate the end of their musical year with a Summer Concert at Turner Sims Southampton. Starting at 7.30pm, the programme will include Tragic Overture by Brahms and Symphony No. 6 by Motzart. Also featured on the night will be soloist performances from Emmy Huang on Violin (as part of Introducton and Rondon Capriccioso by Saint-Saens) and Oliver Veal on Clarinet (performing Concerto for Clarinet by Weber). Tickets cost £9 for adults, £5 for concessions and £1 for under 18s. 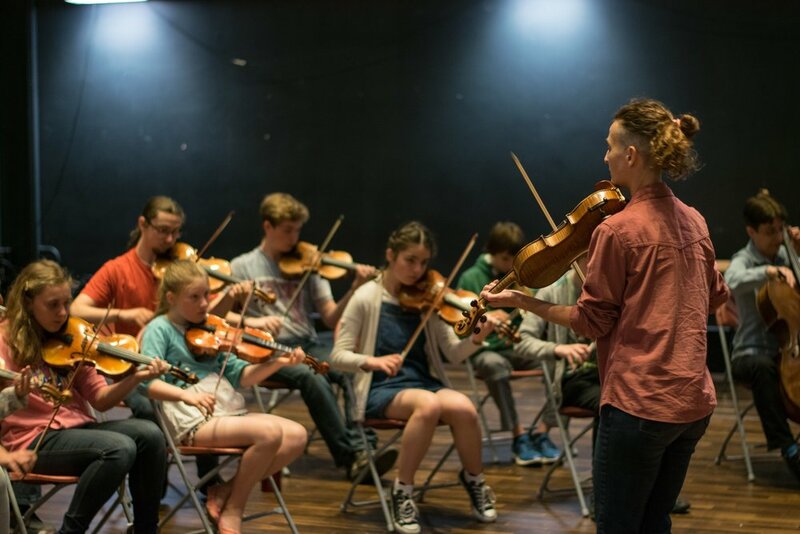 On Sunday 17 June, young musicians from Southampton Music Hub’s string ensembles and beyond were invited to take part in a day-long folk music workshop lead by traditional musician and dancer, Laurel Swift. The participants had the choice of starting with a slow, melancholic Andro (French dance tune) or an upbeat English Jig: they chose the former! All of the music, harmonies and chords were taught by ear. Once the children had a firm grasp of the tune, as well as various ways to harmonise it, they split into groups to develop their own arrangement ideas using the techniques they had learnt. Following a round of performances and a short lunch break, they learnt a ‘lumpy’ English Jig called “The Rogues March” which was then arranged for the group as a whole, with each musician bringing their own ideas to the performance. The day ended with an informal performance to friends and family. For more about Laurel Swift visit her website. For further folk music resources visit the English Folk Dance and Song Society website. On Monday 11 June 2018, Southampton Youth Strings (SYS) will perform a free concert at Ikea Restaurant. Starting at 4.45pm, the 30 minute set will include popular and classical pieces of music. Over the past few year, the performance has become a well received annual event, with some of Southampton's most talented young string players sharing their talents with shoppers and diners from the local community and beyond. "Southampton Youth Strings are delighted to be invited back to Ikea again this year — we're very grateful for the opportunity Ikea give the city's talented young string players to share their music with the community." Family Rock Jam returns on Saturday, with a chance to learn the massive rock anthem, 'I Love Rock and Roll' by Joan Jett. Playing alongside house band Groove Merchant, it doesn't matter if you're picking up a guitar for the first time, or are an experienced player — anyone can join in! Suitable for families of all shapes and sizes — bring your own guitar, or use one of the free guitars provided! On Sunday 6 May 2018, in the bank holiday sun, young musicians in Southampton Wind Band and Southampton Youth Brass Band delighted the crowds that gathered outside the old city walls, on the steps, balconies and restaurants that make up the esplanade at Westquay. Performing a wide range of music, including songs from musicals and traditional brass and wind band pieces, the music filled the air, entertaining shoppers, diners, and the families who sat and watched. 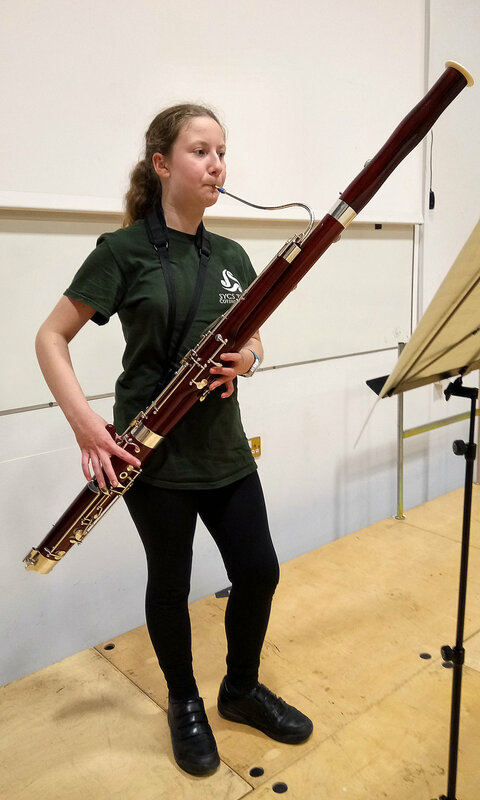 "It was a huge pleasure to watch the hub's young musicians performing at the weekend. They sounded spectacular. 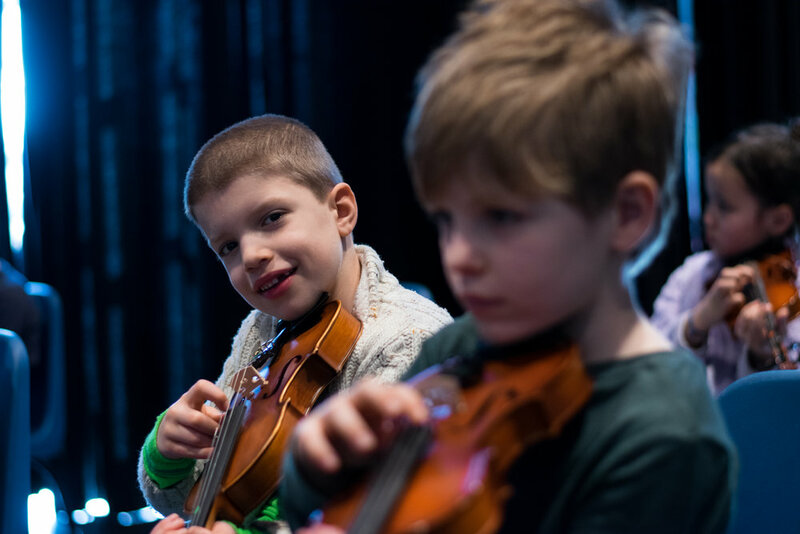 The bank holiday weekend is a special time for families, and so for our young musicians (and their families) to give up their time to share the joy of music with other families in the city is very particularly special." On Saturday 5th May, 13 students, along with Southampton Music Hub teacher, John Hanchett traveled to the Royal Marines School Of Music in Portsmouth for their Low Brass Day. The day, which was organised by the Royal Marine Band Service and the British Trombone Society brought four of the countries finest low brass players together with local musicians. Around 100 Tuba, Euphonium, Baritone, Bass and Tenor Trombones started the morning by forming a huge ensemble creating a loud and majestic sound. Each of the four international soloists led masterclasses, focusing on different aspects of brass playing. Bass Trombonist, Simon Minshall led a session exploring the bass trombonist role within Wagner’s Ring cycle, wowing people with his Contrabass Trombone playing. Robbie Harvey shared his jazz background, giving tips of how to explore improvisation. Robbie also performed several pieces backed by a jazz combo from the Royal Marines. Following a break for lunch, when students took the opportunity to look around School of Music and visit the trade stands — enjoying having a go at playing Soprano trombones and sousaphones among other instruments, Tuba virtuoso, Les Neish gave an interesting session focusing on advanced breathing techniques, and included them in daily practice. Finally world renowned Euphonium star, David Childs delivered a session on performance skills, taking about presentation. To conclude the day, all those taking part formed the large low brass ensemble again playing a piece composed for this event which featured the four fabulous soloists. “It was an inspirational event, an utterly fantastic opportunity to hear playing of the highest caliber. I’m sure all the students will be taking tips from today into their own practice and performance. The young musicians had a fantastic day, and were also a credit to their parents and schools with how they engaged with this Low Brass Day." Southampton Wind Band and Southampton Youth Brass Band are hosting two open air concerts at Westquay Esplanade this bank holiday weekend. Performing in front of the old city walls, and as part of Westquays "Sunday Brunch" series, these free concerts, taking place on Sunday at 1pm and 2pm, are the perfect way to enjoy (what hopefully will be) the sunny long weekend ahead. Other performers in the Sunday Brunch series include LoveSoul Choir — one of Southampton Music Hub's partners — performing on Sunday 27 May. On Saturday 24 March 2018, young orchestral musicians from across the city will come together for an inspirational evening of music at Central Hall. 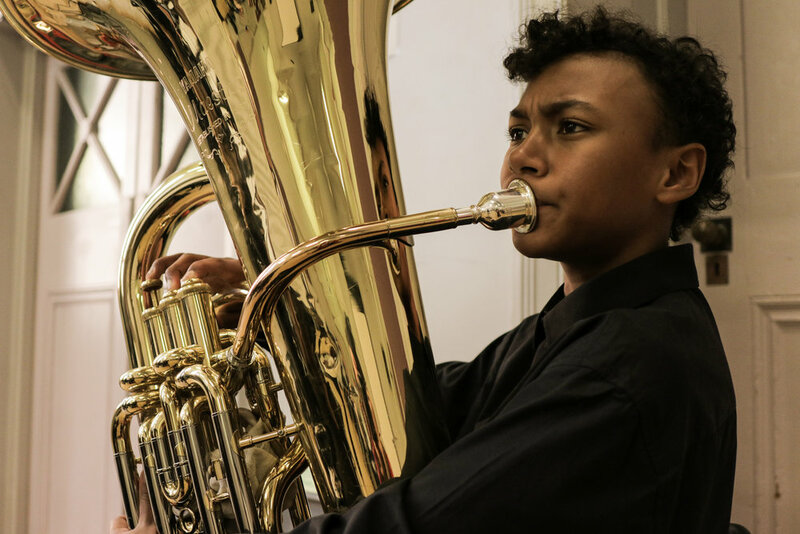 Featuring performances from Acorn Strings, Elgar, Southampton Youth Strings (SYS), Southampton Youth Concert Sinfonia (SYCS) and Southampton Youth Orchestra (SYO) the evening will also feature a special guest performance from Airplay, the city's foundation youth wind band. Tickets cost £10 for adults, £5 for concessions, £2 for children under 16, and a special family ticket (two adults and two children) costs £20. Advance price tickets can be reserved up until 3pm on Friday 23 March, by contacting the Southampton Music Hub office. Forty-five of the Hub's youngest string players enjoy a morning of creative music making. 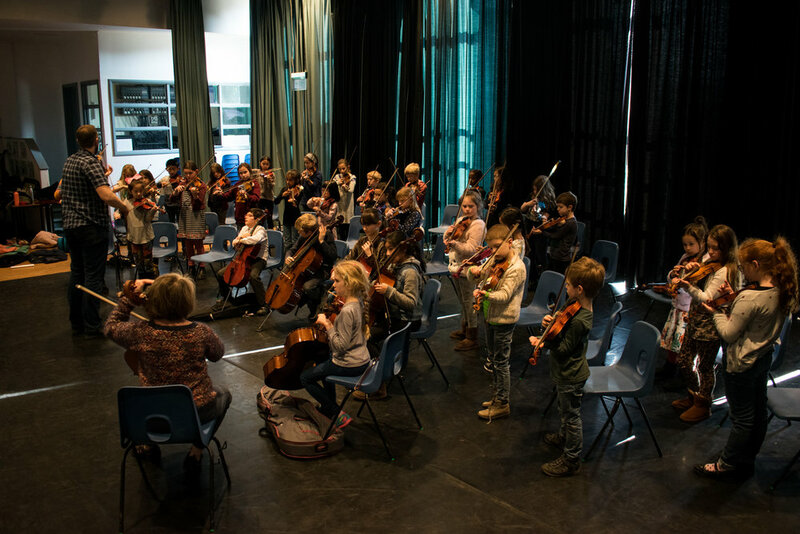 On Saturday 24th February, members of Acorn Strings and Elgar, the Hub's two beginner strings ensembles, spent the morning in a workshop with workshop leader Neil Valentine. The day started with a few warm-up games to help the children feel some of the rhythms they were about to play. They then learnt to play "Ah Ya Zeem", a traditional Arabic tune, before exploring different ways to change their performance of the music. The players also had the chance to visit the Southampton Youth Orchestra mid-rehearsal, to experience the sound of a full symphony orchestra and see how they rehearsed. Finally, they worked as an ensemble to turn the short tune into a five-minute work adding to the original piece with their own ideas for creating soundscapes using different techniques on their instruments. "It was really exciting to see the children work creatively without the confines of sheet music and an orchestral setting! It was also a good opportunity for the children to get to know each other better, outside of the weekly rehearsals. Several of the children played the music to each other as soon as they arrived at the next rehearsal!" On Saturday 27 January 2018, over 400 children, young people and adults, from all across the city, came together at Central Hall to take part in free workshops and performances as part of Southampton Music Hub's Music Fayre. The day opened with Acorn and Elgar string groups performing together for a growing audience of families, including the Mayor and Mayoress of Southampton, who then officially opened the Music Fayre. After the official opening, the Mayor and Mayoress joined Bournemouth Symphony Orchestra, and over 150 players of all ages and abilities, picking up a "Bamboo Tamboo", to be part of the biggest open-access, Family Orchestra the city has ever heard. Throughout the day free music workshops and performances included choirs — Delicious Sounds, Family Singing, Sing Out and Sing Force — as well as community music groups and ensembles — Pulse8, Ukulele Groups, Folk Active and Family Rock Jam — and families were also greeted by performances from some of the city's most talented "Award Holder" musicians. Southampton Music Hub, Hayes Music, CoMA South and Friends of Southampton Youth Orchestra also hosted stalls on the day. "It was an incredible pleasure to host the Music Fayre again this year: proudly sharing Southampton's diverse musical communities; and inspiring families to take part in making music together. With free Family Music workshops now travelling around the city throughout the Spring, families of all shapes and sizes can find out how making music helps make lives better!" On Saturday 27 January 2018, Central Hall plays host to a jam-packed programme of music workshops, performances and stalls at Southampton Music Hub's Music Fayre. Joined by hub partners as well as local music and arts organisations, families of all shapes and sizes can come and join in with music activities suitable for all ages and abilities. This weekend, families of all shapes and sizes can be part of the free music workshops and performances at Southampton Music Hub's Music Fayre. From 11am-3pm on Saturday 27 January 2018, Southampton Music Hub will joined at Centrall Hall by hub partners and local music and arts organisations to proudly share Southampton's diverse musical communities. As we share some of our highlights from the start of this year, we also look forward to 2018, working with schools, partners and families to bring life-changing music to every child in our city. Southampton Music Hub has been longlisted, alongside five other music hubs, for the MEC Music Education Awards 2017, recognising the hub's imaginative, creative, ambitious and inspirational approach to music education. The shortlist will be announced in December, and the final awards will be given in February 2018. "The whole team are delighted to have been longlisted for this award, as recognition of the excellence we achieve together. 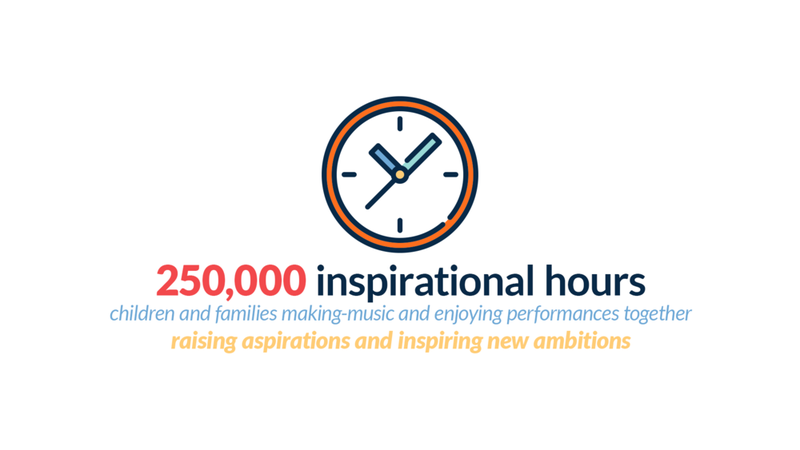 It is an honour to help lead an incredible partnership of teachers, schools, families and music organisations from across the region, as we work towards our shared purpose of bringing life-changing music to every child in our city." On Saturday 9 December 2017, Southampton Youth Concert Sinfonia (SYCS) will be joined by the Splash of Red ladies choir and singers from Southampton Music Service for a Christmas concert not to be missed. "After a hugely successful tour concert with Splash of Red ladies choir, SYCS are delighted to, once again, be joined by the choir on a return visit this Christmas. The concert is going to feature a wide range of festive favourites including an exciting rendition of O come Emmanuel also featuring Southampton Music Service singing students." On Saturday 4 November 2017, Southampton Youth Brass Band (SYBB) were joined by members of the world leading Cory Band for a day of expert workshops ahead of a joint concert together at Chandlers Ford Methodist Church in the evening. 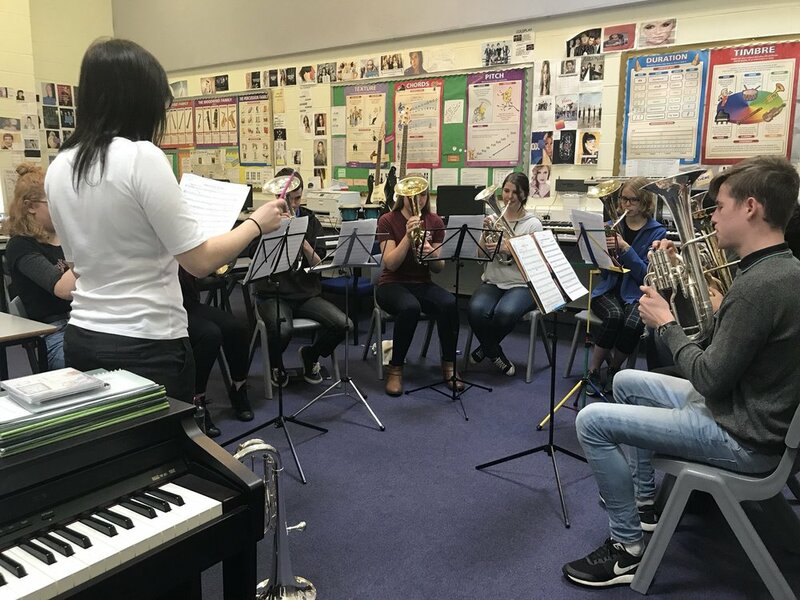 The day included sectional masterclasses, with each group of instruments working with expert players from Cory to develop their parts in the two pieces the bands would perform together in the concert later. The five Cory Band members also performed pieces of music and answered questions from members of SYBB about their incredible experiences touring the world as renowned musicians. The evening concert, attended by over 300 thrilled audience members, gained the attention of the Daily Echo with a glowing review of the evening. On Saturday 11 November, Southampton Youth Concert Sinfonia (SYCS) will be part of a charity concert, performing alongside New Music Makers, a 50 piece choir from Hedge End, to raise funds for Countess Mountbatten Hospice Charity. "This is not only going to be a fantastic evening of music making for a great cause but there will also be an art exhibition in the interval presenting the work of local artist Emily Quick." "This concert is a great example of why we invest so much in our ensembles: giving our young people vital opportunities to contribute to, and make a difference in, their communities and our city." Tickets cost £10 for adults, £8 for concessions and £5 for children and can be reserved at St Paul's Church Office or by emailing emquickmusic@gmail.com.